Unique frosted cupcakes deserve their own special bag. 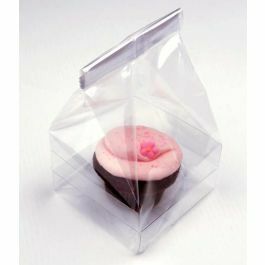 Our CBG4 cupcake bag set is perfect for packaging single standard size cupcakes or muffins. This set includes a 4" x 4" x 7" flat bottom gusset bag, a plastic insert, and a white paper bottom. To use the insert, fold the long tabs up and place on the sides of the bag to keep gusset from touching contents. Fold the short tabs down and place on the front and back of the bag. This material is 1.6 mil thick and is made of BOPP for exceptional clarity. 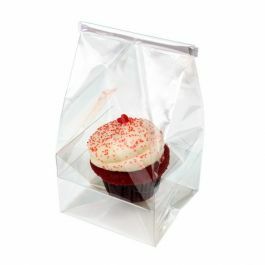 The white cardstock bottom offers a sturdy base to showcase your cupcake and offers a nice display. 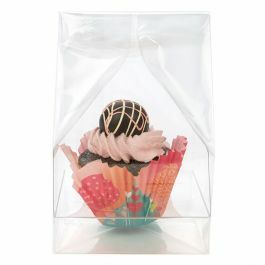 Single cupcake sets give each frosted treat an individual platform and are ideal for brand promotion. Custom printing is available. Heat sealing is not recommended for this bag. Close with stickers, tin ties or labels. Clear round stickers are included for a tamper-resistant closure. Food safe. 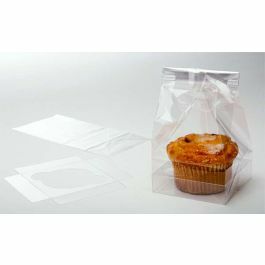 Outer Dimensions: 4" x 4" x 7"
The primary use for CBG4 is for holding a single standard size cupcake or muffin.